Hansu told me that there may be transport problems. So just to be sure I leave in the dark to the bus station at 05:00 AM. With my flash light I find my way on the now dangerous rough road passing small river beds to the Keren bus terminal. An alarmining number of people is waiting in severeal queues for the various destinations. I Ask for the Asmara queue and join the line of waiting passengers. When I am close to boarding there seems to be a problem. I am supposed to have a number written on my hand to mark my position in the row, but I haven't one. Some passengers have to laugh. No number means line up again in the back of the queue. With his flashlight the driver checks the numbers on the hands of the passengers. "Step aside" he addresses me. When all passengers have boarded, the last seat behind the driver is for me. business class and with a nice view on the road in front of us. The ultimate Eritrean hospitality towards the tourist, unfamiliar with the boarding procedures for the buses. 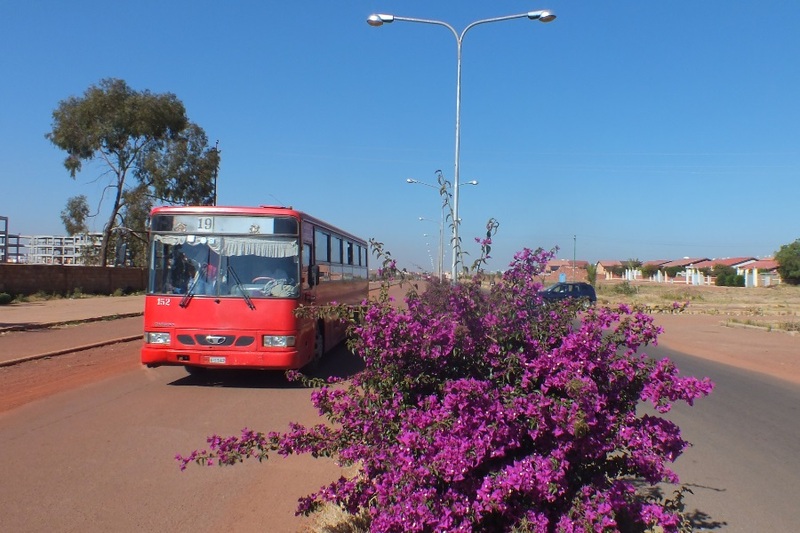 At 06:00 AM the bus leaves to Asmara with a few stops just outside Keren to add cargo that will be accompany us to Asmara. 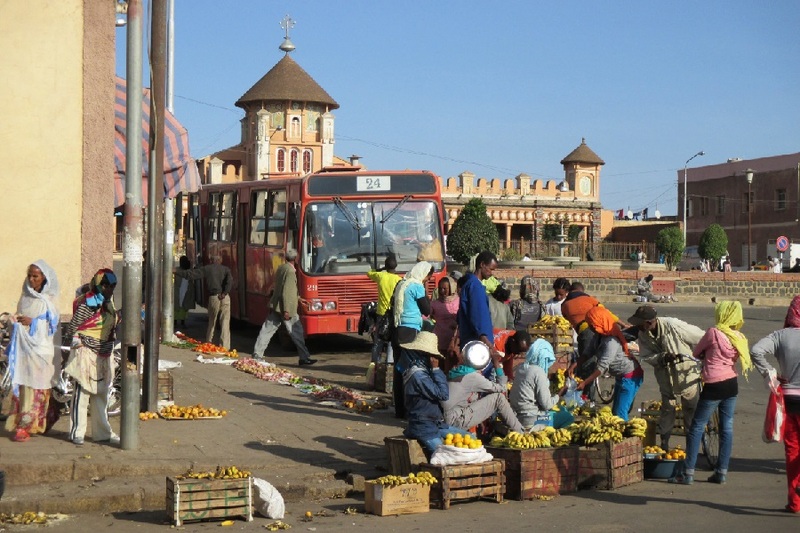 Just before 09:00 we arrive at the Edaga Hamus bus station in Asmara. I invite the driver for a lunch. A meal does not fit in his working scedule, but I give him 50 Nakfa for a lunch anyway to show my appreciation for solving my problem at the Keren bus station. 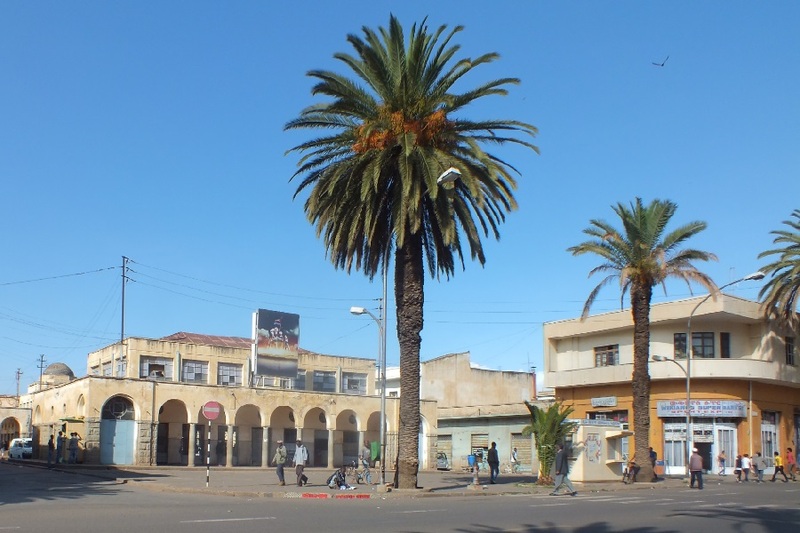 Compared to Keren I experience the climate in Asmara as pleasantly cool, with plenty of sunshine under a perfect blue sky. A comfortable breeze further adds to a moderate climate 2.400 meters above sea level. After I have a shower, and fresh clothes, I will visit various governmental offices. At the Eritrean National Chamber of Commerce I meet Taddese Beraki to talk about business development and information in Eritrea in an attempt to revitalize the Eritrean economy. The ENCC is financed by the Eritrean enterprises. Hard times for their business means hard times for the ENCC as well, delaying its programs. Second is the Eritrean Airlines office in the Alhashime Mall, where I have tea and a very nice conversation with Almaz Berhane, sales manager of Eritrean Airlines. The airline survived the worldwide economic crisis, but is now operating as a regional airline with four or five destinations in Africa and Saudi Arabia, leaving the intercontinental destinations to Egypt Air, Turkish Airlines, and Yemenia. Negociations with Qatar Airways may result in improved accessibility of Eritrea for the potential visitors. The US banned leasing of aircrafts to Eritrean Airlines, as a step in imposing of sanctions on Eritrea. The airline is now operating three Airbuses with Bulgarian registration codes. On my way to the Corea Housing complex I pass the Ministry of Tourism. It is almost lunch time, but I should give it a try to visit the office. Greeting the secretary of the minister, she suggests I should meet de minister herself as well. I am welcomed in her office, where I have a pleasant conversation with the minister, Askalo Monkorios, and another guest. I explain my program of this years visit to Eritrea. It will include an attempt to deliver the flyers of a UK organisation called Legs4Africa. Ther minister advises me where to deliver the information (I should visit the new location of the Ministry of Labor and Human Welfare in Godaif. It used to be Askalu Monkorios ministry in the recent past). At Classic Pastry, opposite to the Ministry of Tourism I buy one of my favorites in Asmara: two mini pizza's: bread decorated with chily, onion, tomato and spices.The bread and a large bottle of mineral water will be my lunch for today. 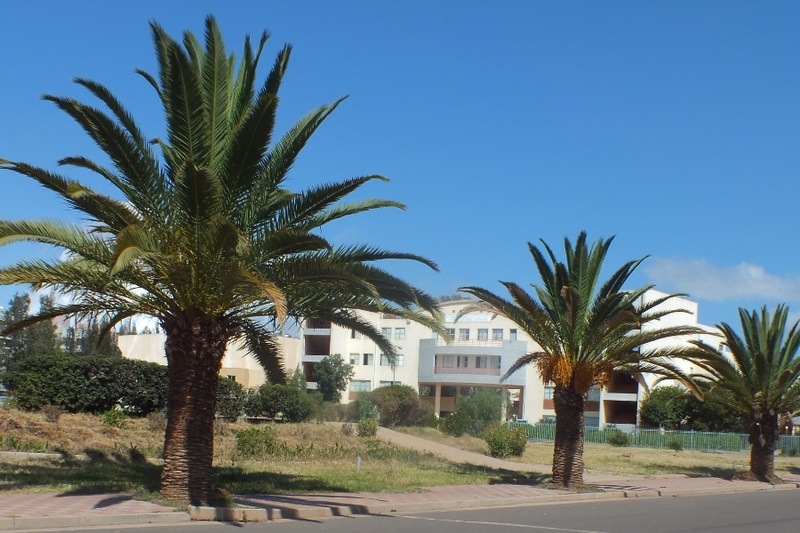 From the Ministry of Tourism I walk to the Ministry of Labor and Human Welfare in Godaif. It is a 30 minutes walk. The ministry is still closed because of the lunch break. The guard offers me a chair on the stairs at the entrance of the building. The ministry is moving in from the old location in the Expo area. A 60 year old Mercedez Benz truck is used to move the furniture. When the person responsible returns, I explain my mission to get the message for Legs4Africa to Eritrea. 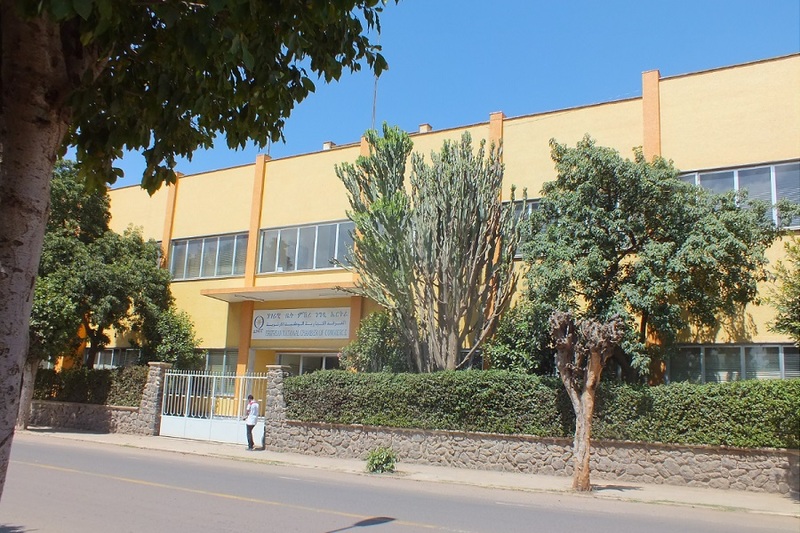 Eritrean National Chamber of Commerce - Denden Street Asmara Eritrea. 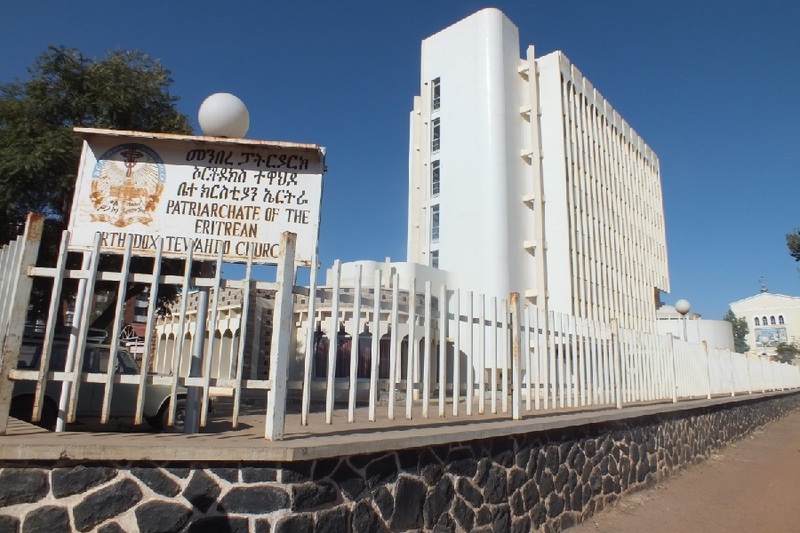 Orotta Medical Surgical Referral Hospital - Aarerib Street Asmara Erittrea. 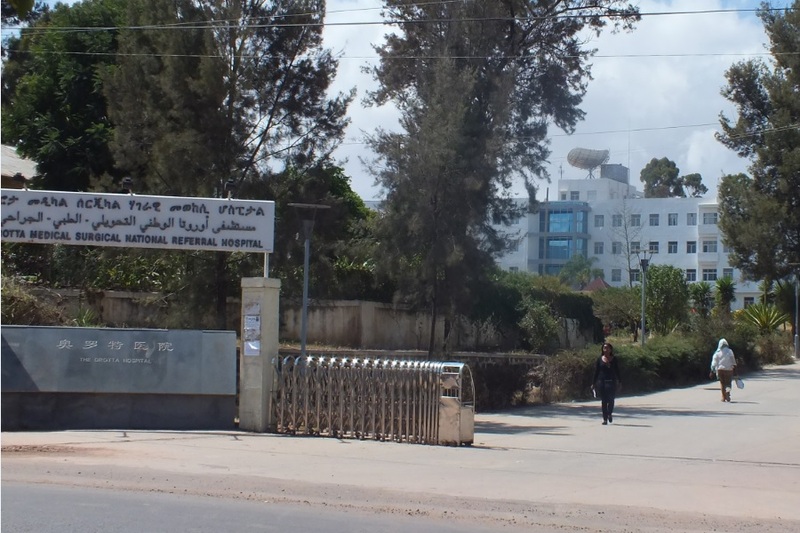 Denbe Sembel Junior and Secondary School - Asmara Eritrea. 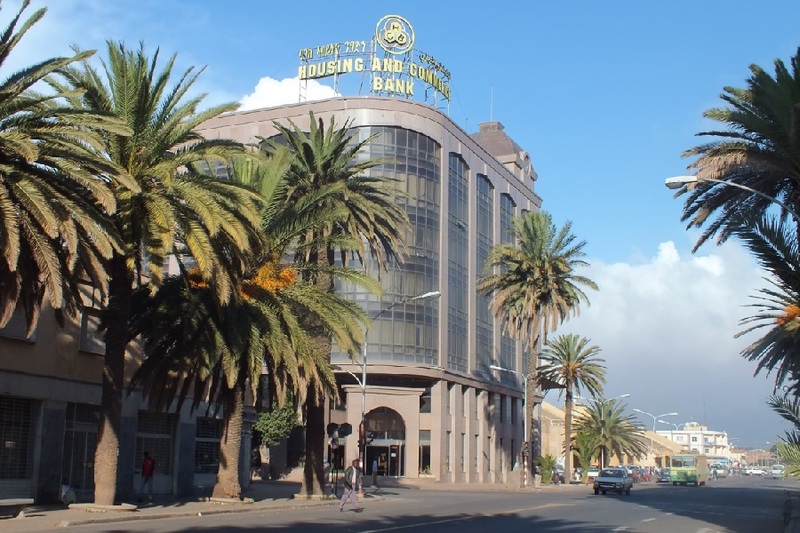 Housing and Commerce Bank - Bahti Meskerem Square Asmara Eritrea. 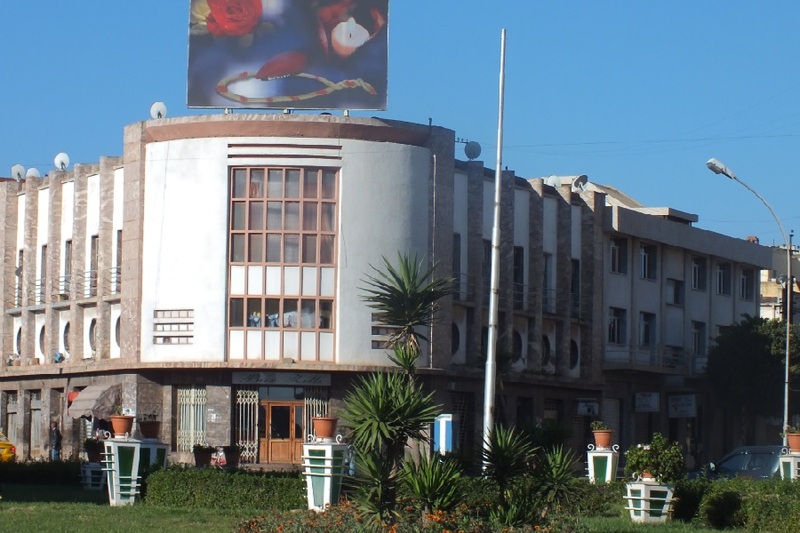 Bar Zilli - Shida Square Asmara Eritrea. 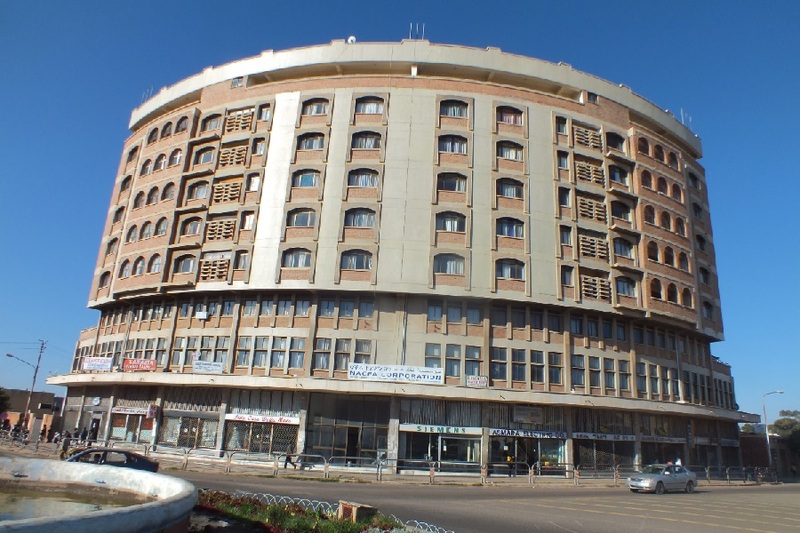 Nakfa house shops and offices - Mereb Street Asmara Eritrea. 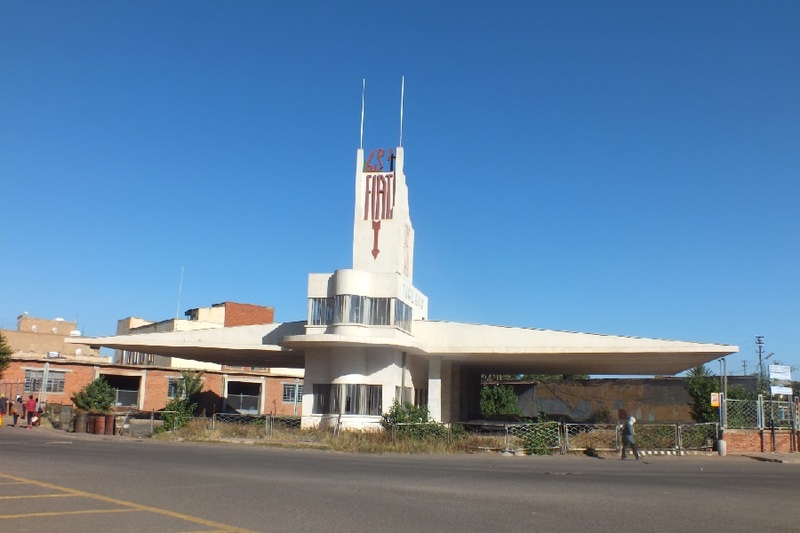 Fiat Tagliero garage and fuel station - Asmara Eritrea. 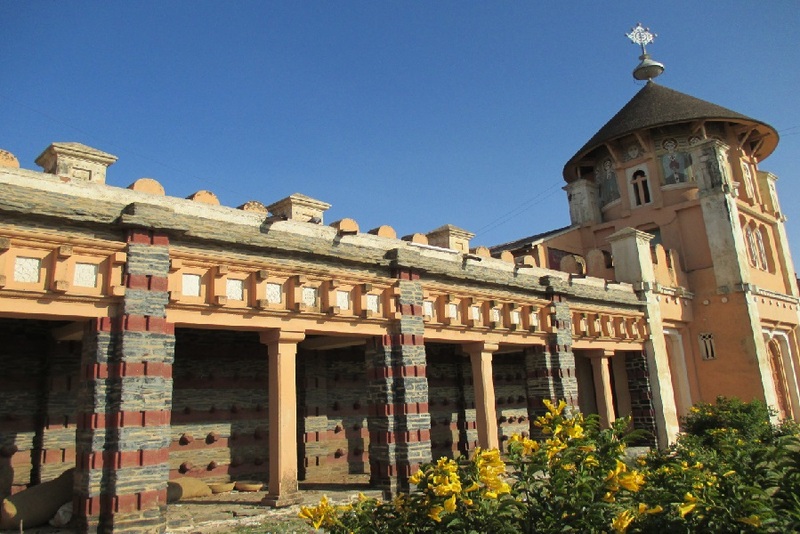 Patriarchate of the Eritrean Orthodox Tewahdo Church - Warsay Street Asmara Eritrea. 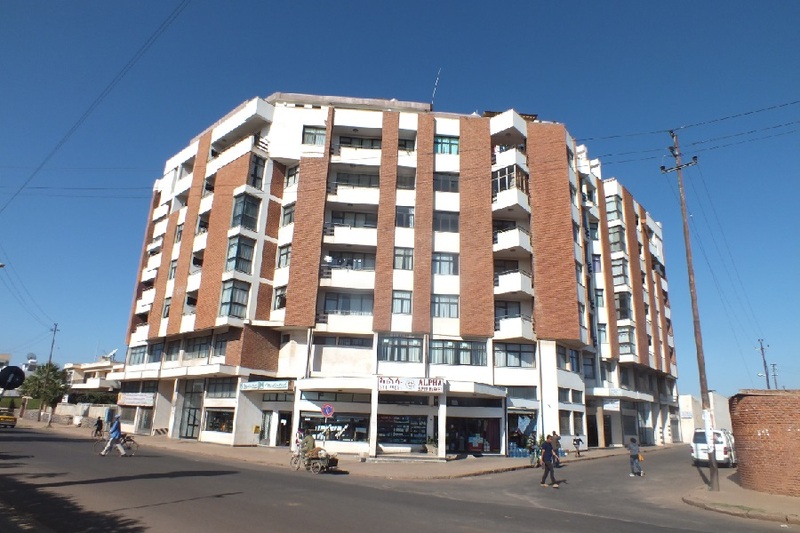 Shops and apartments (Alpha Supermarket) - Warsay Street Asmara Eritrea. Container converted into a small grocery shop - Expo area Asmara Eritrea. 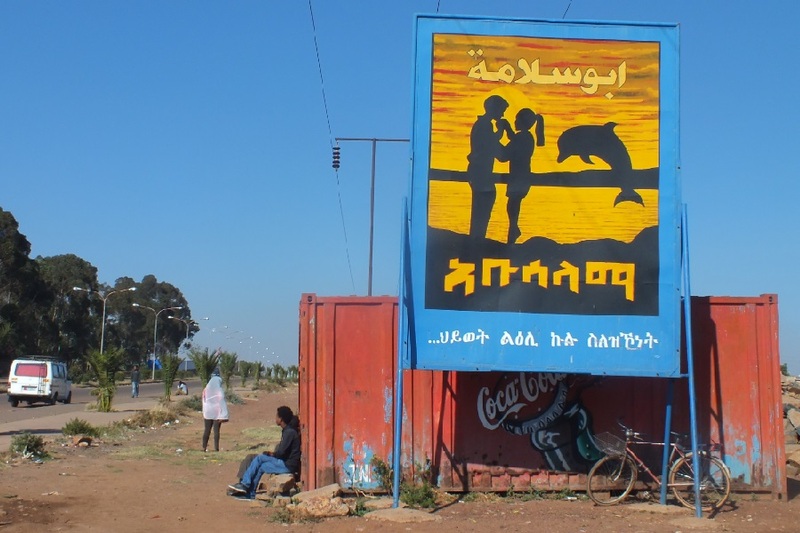 Road to Nda German and Kushet - Asmara Eritrea. 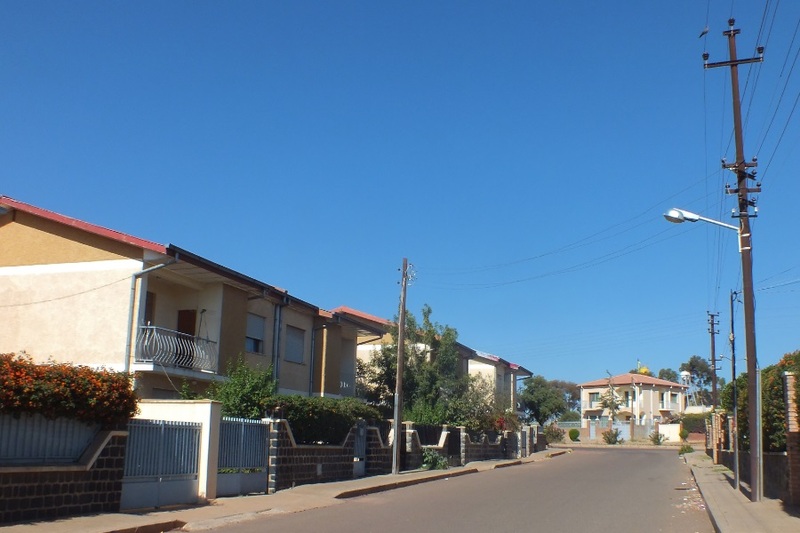 Space 2000 Housing Project - Asmara Eritrea. 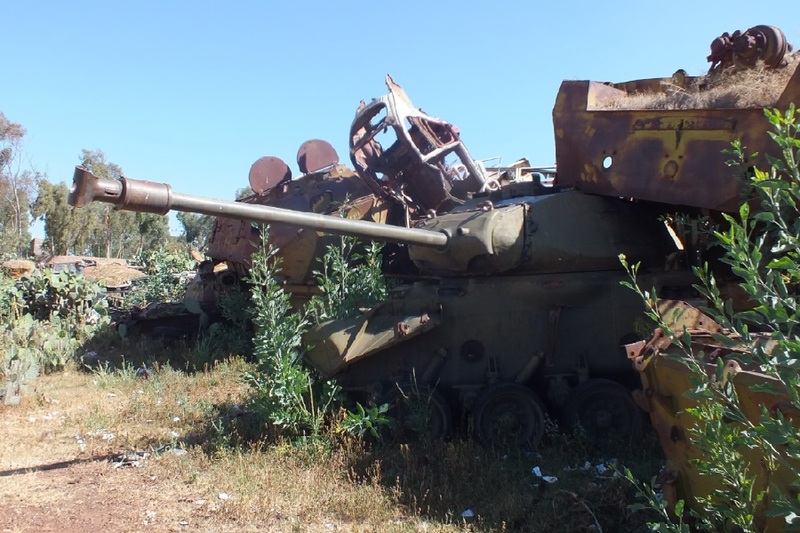 Tank and truck graveyard - Asmara Eritrea. 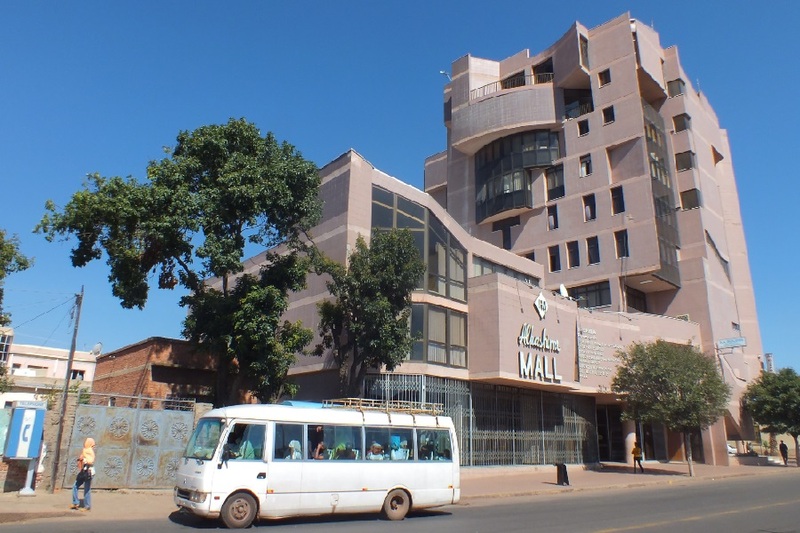 Alhashime Mall - Warsay Street Asmara Eritrea. 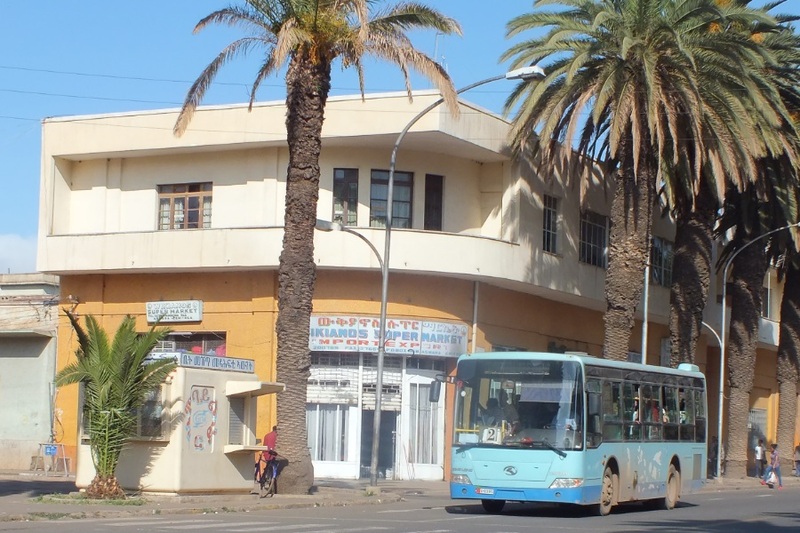 Wikianos Supermarket - Harnet Avenue Asmara Eritrea. 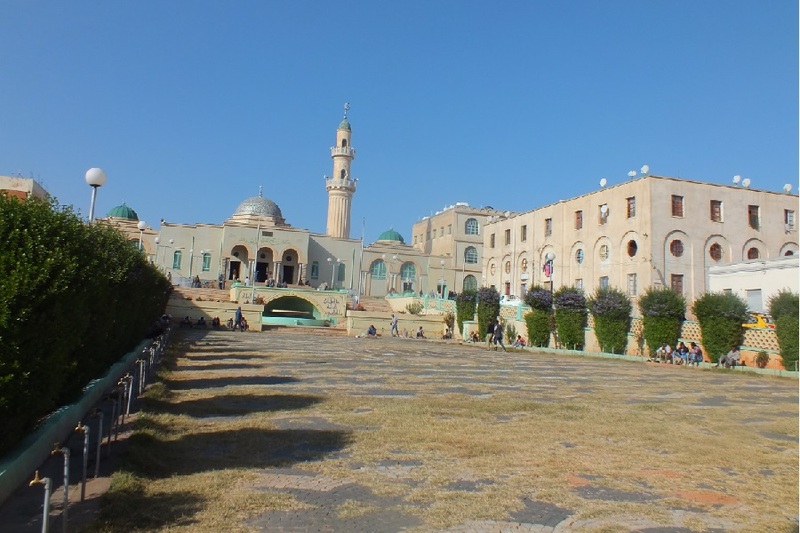 Al Khulafa Al Rashiudin Grande Mosque - Asmara Eritrea. Salena! (picture us!) Nda Mariam Coptic Cathedral - Asmara Eritrea. Nda Mariam Coptic Cathedral (detail) - Asmara Eritrea. 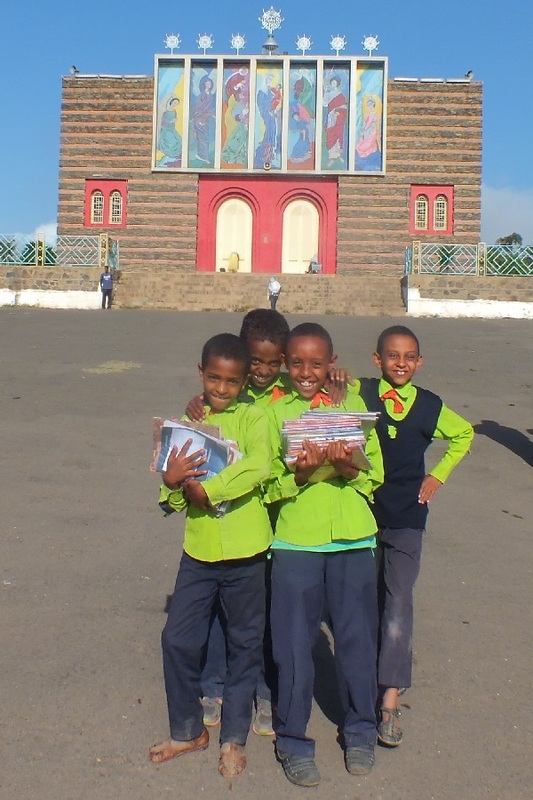 Bus stop - Nda Mariam Coptic Cathedral - Asmara Eritrea.